Downtown San Pedro's Arts, Cultural and Entertainment District (SPACE) and its immediate surroundings are home to over 90 visual artists as well as a lively and varied collection of restaurants, performing arts venues and art galleries. The district is anchored by the Warner Grand Theatre, a 1,500 seat historic art deco movie palace, Little Fish Theatre, which presents repertory theater in a converted garage, and the Loft Studios, a three-story warehouse where a concentration of fine artists do their work. The District's streets are lined with artists' live work spaces. The studios come alive on the 1st Thursday of every month, with gallery receptions, artist open houses, and live music. Throughout the month, enjoy live performances from contemporary plays to acoustic music, to foreign films and more. Come for a visit and enjoy our SPACE. Meetings are held on the second Monday of every month at 4 pm at the San Pedro Chamber of Commerce Board Room, 390 W. 7th Street, San Pedro. San Pedro, California, a historic Los Angeles community adjacent to the Port of Los Angeles, is home to an active visual and performing arts scene. 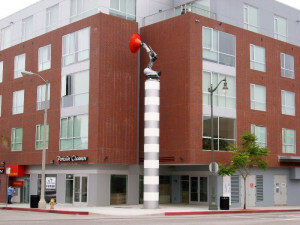 In 2007, the Los Angeles Community Redevelopment Agency led an effort to designate a section of downtown San Pedro as a City of Los Angeles arts district. Local civic leaders, community members and artists served on the committee to form the district. The first step was to complete a study of the needs and conditions of the local arts environment. This study was performed by AMS Planning & Research, based in Petaluma, CA and completed in June, 2008. On February 13, 2009, the L.A. City Council has adopted a resolution to form the arts district, by unanimous vote.